Transfer to the hotel and evening meeting for the kick off before the tour. Signing all documents and learning more about each other, route, schedule for the day, etc. Moscow walking tour. Visiting Kremlin and Red Square, GUM, metro and many other interesting places. On this day we also change money, buy local sim cards, prepare bikes, buy rain suits and other staff if you forgot something. In the morning we will ride to Red Square to take a beginning of the tour group photo. We are leaving Moscow right after that and with several stops along the way we reach one of the Golden Ring cities located on the banks of the Volga River. On our way we visit Vladimir, a little town where we make a stop to see the Dormition (Assumption) Cathedral, a great architectural wonder of the 12th century. In Nizhny Novgorod we will walk along the Volga embankment, we will visit Novgorod Kremlin and we will have a dinner at the local restaurant. In the first half of the day we visit national museum in Kozmodemyansk. After that we move to Kazan, ancient city known as the third capital of Russia after Moscow and Saint-Petersburg. We will visit the Kazan Kremlin, second largest in Russia. Its origins date back to the 10th century. In the evening we will have a delicious dinner with local food. With good secondary roads and small off-road segment we will reach Kalashnikov hometown. It’s a place where famous AK-47 is produced. We will visit armory museum and shooting range where you will try AK-47 on your own. After that we go to the local home style hotel with interesting and delicious regional food. It will be a long riding day with lots of picturesque roads, oil production plants, farm fields of Perm region, second breakfast from local food store, forest berries, apples and other fruits and finally shot of vodka in Yekaterinburg. Day off in Yekaterinburg. We sleep well, have some free time in the morning and in the second half of the day we walk around the city with a local guide. We will see 1905 Square, Oktyabrskaya Square, Church on the Blood, Historical Square, Garden of Stones, and the Obelisk at the border between Europe and Asia. In the morning we visit Ganina Pit, a place where last Russian emperor was buried. Today it’s a memorial complex and a monastery. After that we go to Irbit, a motherland of Russian motorcycles Ural. We will visit a factory with its museum and make a Ural motorcycle test drive. That will be a memorable experience. After lunch in local canteen we take off for Tyumen and arrive in the city in the evening. We check in, leave the bikes in the parking lot and explore Tyumen by foot. We will have a walk along the embankment and the pedestrian bridge over the Tura River, and visit Znamenskiy Cathedral. We will also bath in the hot springs in the city center and then we will have a dinner at the restaurant nearby. A calm road to Omsk is waiting for us today. On our way we visit Ishim, a small city with a well preserved architecture of the 19th century. In Omsk we have a walking tour over the city and visit main places of interest. We have a peaceful and beautiful road to Novosibirsk, the biggest city on the Trans-Siberian route. Today this is the 3rd largest city in Russia, a cultural and scientific capital of Siberia. In the evening and next day in the morning we will have a walk in the city center. A short riding day, but still full of interesting places and people. This day we will visit our friends in Urga, a small city in the center of Siberia. Here we have a lunch, a walk around this small provincial city, have some free time. In the second half of the day we arrive to Kemerovo, a coal industry center of Russia. Here we will visit several museums and spend evening in a country house hotel in the forest. Tomorrow we have a long ride, but today it’s time to relax. 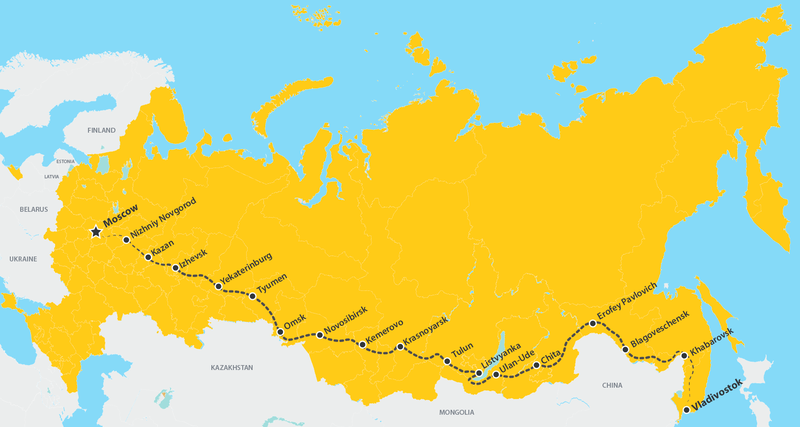 We are on the Trans-Siberian route again and head to Krasnoyarsk, another big Siberian city. The city is situated on the Yenisei River, one of the biggest rivers in the world. We check in and explore the city center by foot. Today we service our bikes, take some rest and visit Krasnoyarsk National Park “Stolby”, a place where you will see taiga nature. It will be at least a half day walk with climbing hills and mountains. In the evening we have dinner at a cozy restaurant with local food. Road to Tulun through many small villages and stops. Among most interesting places we are going to see is Taishet bike guesthouse with Igor Shalygin. We spend a night in Tulun in a country hotel with Russian banya (sauna) on the banks of the river. Final 450 kms to great Baikal Lake await us! After good rest and healthy breakfast we visit Baikal Museum and Cherskogo Peak to take photos of the lake. We also visit local market and have a boat trip. The road to Ulan-Ude goes along the Baikal shore. A long time ago Ulan-Ude was a Mongolian city, now it’s Russian one. Lots of nationalities live here: Buryats, Barguzin Jews, Evenks, Mestizo and others. There are many Buddhist temples in the city. At the restaurants we have a chance to try the traditional local food and famous Baikal fish – omul. In the next five days we have a road to Vladivostok. The first city on our way is Chita, that’s where the Decembrists were sent after they tried to make an uprising in 1825. The city has a Museum of the Decembrists. The town is called after the famous Russian entrepreneur, traveler, and explorer Yerofey Pavlovich. In the 17th century he charted the Amur River and built a fortress somewhere nearby. Unfortunately, it is not preserved. Blagoveshchensk is the 5th biggest city in the Far East. It was established in the middle of 19th century to guard the borders of the Russian Empire. The Amur River is a borderline between Russia and China. Locals often visit China to drink Chinese beer, buy souvenirs and have a nice lunch. The journey to China takes only half an hour. Khabarovsk is probably the most beautiful city in the Asian part of the Trans-Siberian route. The Amur River is wide here, hills are beautiful, plentiful of forests. The city has lots of Chinese markets and restaurants, and we have a chance to check them. This is our destination point. The city is located at the southern extremity of the Muravyov-Amursky Peninsula and surrounded by the sea from three sides.Today we have a dinner and a massage. Rest after long trip and after that we do a sightseeing tour over the city. We will see a Sea port, an embankment, bridge to the Russkiy Island, local pedestrian street and many other interesting places. RIDE YOUR DREAMS is engaged in extra ordinary journeys by road. The owner fulfilled his dream of riding from India to UK 33 years after he first dreamed it during his college days. He rode on the 1994 Enfield 350 CC motorcycle regd nos. GJ 6 Q 871 from Vadodara to London across 14 countries in 76 days. © 2019 Ride Your Dreams.